Audiobook. Following Vadim Volkov, radio, known stalker get-together on the voice acting books Andrei Levitsky "antiworld Loop" and "anti-world network." Software - a professional hacker with a dark past and uncertain future. In pursuit of thrills and easy money, he gets involved in a dubious venture, then as a result of a daring break-in Soft hands are not only money, he thinks himself. In the program code stored on a USB flash drive, the key to the hidden features that will change the world. Fleeing persecution, the attacker fled to the exclusion zone, unaware that he had become one of the pawns in the Great Game is still there behind the perimeter. And in Zone game continues. Software will visit the places where you do not ever get to even the most cunning stalker, to solve the riddle of the mysterious "suggestor" and apply their skills there, where to find a use for them at first sight impossible. 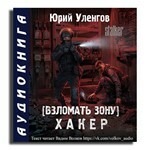 Вадим Волков отлично читает, приятно слушать книги в его озвучке. Всем советую!